Burne-Jones was a second-generation member of the pre-Raphaelite artists, who rejected the growing materialization of industrialized England. Instead they focused on the comparative simplicity of the medieval world and the art of Italian painters prior to Raphael. 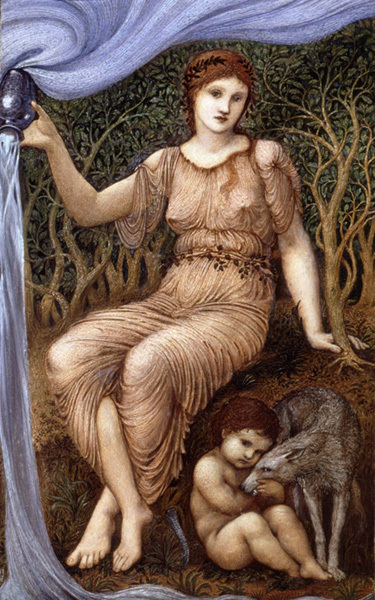 Earth Mother, which shows the influence of Renaissance artists like Botticelli, was painted by Burne-Jones in connection with his series of stained-glass windows representing the planets. Here is an allusion to Earth Mother's role of nurturing all life: human, represented by the child; animal, by the wolf; and horticultural, by the trees and vegetation. The snake next to the feet of Earth Mother symbolizes fertility and relates to Ceres, goddess of earth. To show earth's role in the transitional nature of water, the allegorical figure is represented holding up a blue jar that produces clouds, rain, and eventually a stream below. To create the ivorylike skin of the figures and the rich textures throughout, Burne-Jones employed the ancient technique of encaustic. The pigments are bound in a wax medium, over which the artist applied oil glazes and, in certain areas, minute touches of gold for an even more decorative effect.